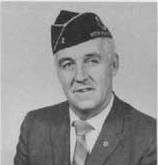 George Young was commander in 1959. Also, he was the finance officer and helped support several activities including running successful bingo games for the Post. In addition, he served as Battalion Chief for the city of Manchester Fire Department.